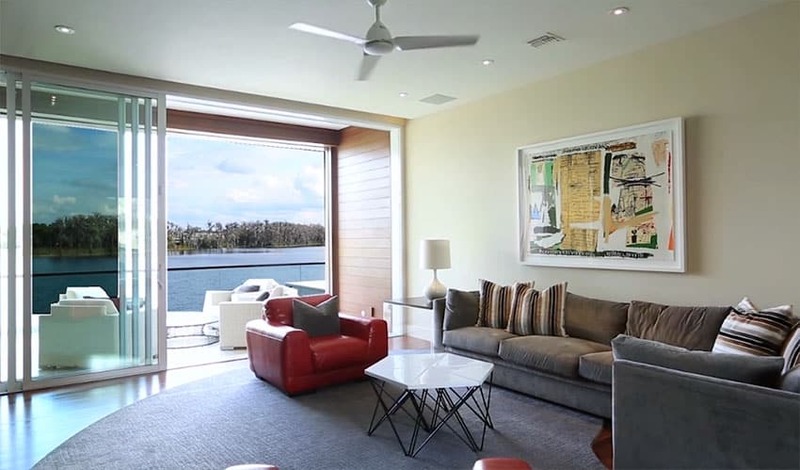 This beautiful custom modern home by Phil Kean designs features high-end furnishings, intricate details and lake views. The home sits on a lake front lot with a total of 4 bedrooms and 4 1/2 bathrooms with a workout room, play room and movie room. The backyard provides pure outdoor living with a large lake front balcony, modern swimming pool with wraparound deck and covered lanai. This two story modern house design employs clean cuts, sleek forms, and a minimalist materials palette to achieve a stylish aesthetic. The modern driveway, some might agree, is the face of the custom residence. As such, it’s imperative that its character reflects that of the house. 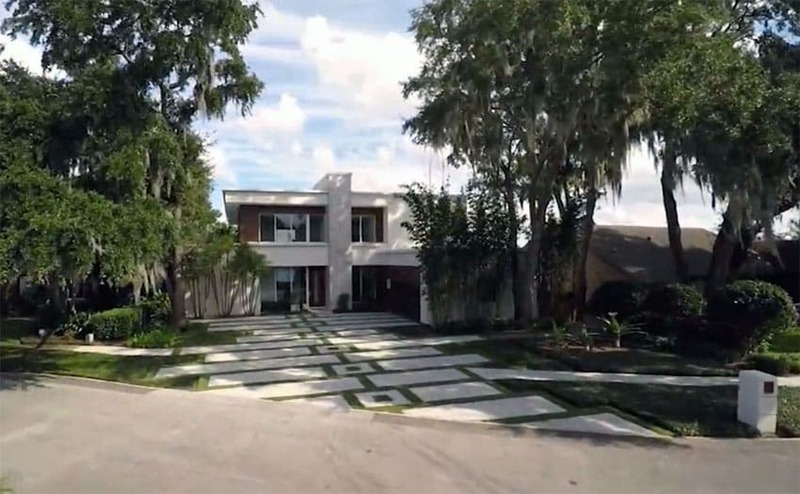 In this example, the concrete and grass ground covering has a linear and geometric pattern that perfectly encapsulates the modern minimalist vibe of the residence itself. To the side of the home, we have a covered patio that houses a quaint outdoor kitchen and some seating nooks for a more cozy dining or lounging experience. 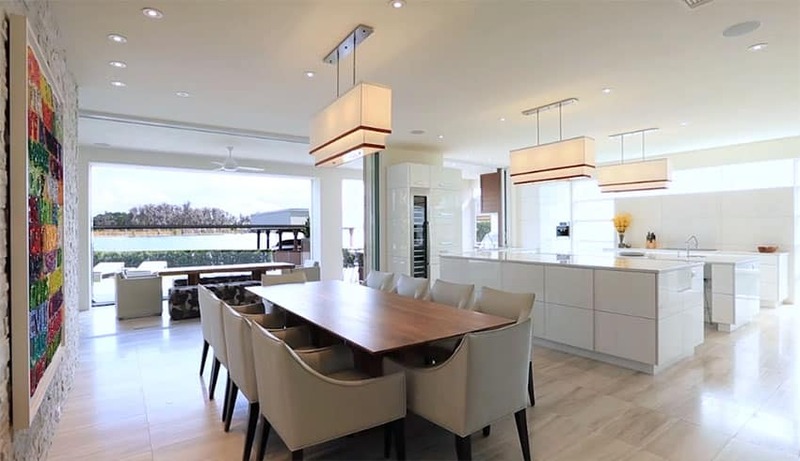 The space organically flows into the adjacent modern white main kitchen with the use of large glass sliding doors that link the two kitchen space together. 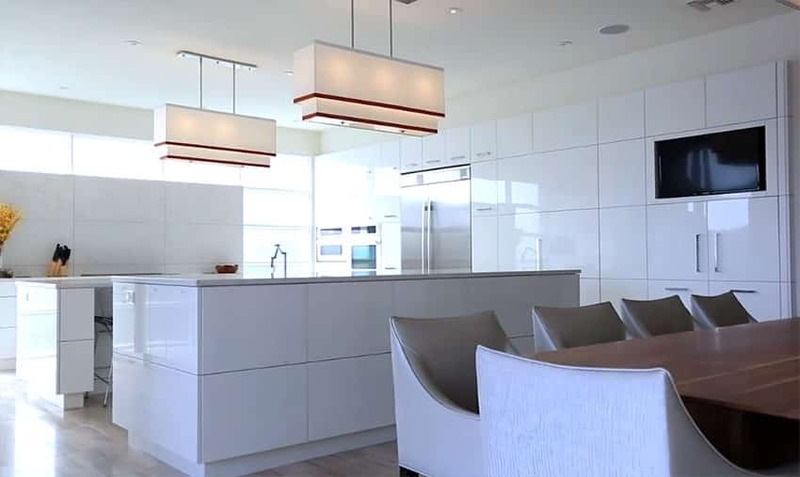 The modern kitchen design has a large, open concept layout. The materials used are glossy white acrylic wall panels that really reinforce the house’s clean theme. 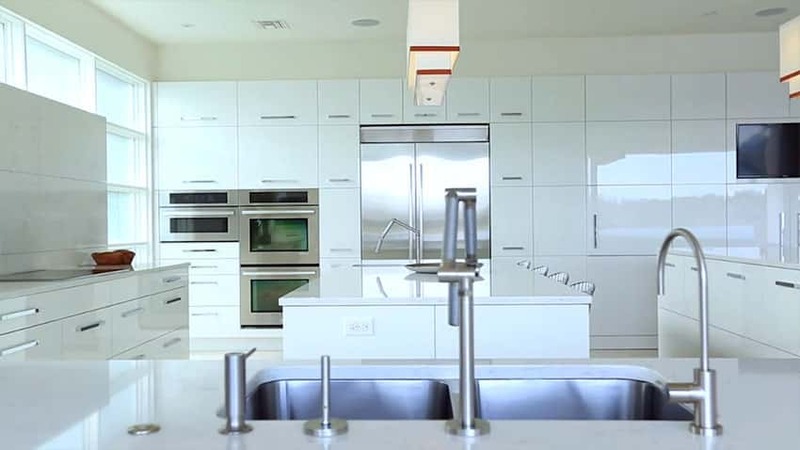 This contemporary modern kitchen has several high-gloss cabinets for ample storage space as well as two kitchen islands in similarly high-gloss white to give users plenty of counter space as well. In this close-up view, we can more intricately see the detailed finishes and installed fixtures in the kitchen. The sleek aesthetic even translates to the sinks and faucets used in the counters. The hinged faucets and under-mounted double-bowl kitchen sinks are in a modish stainless steel finish. The middle kitchen island also serves as an eat-in dining breakfast bar. Modern homes are simply not complete without a coffee maker, and this home, with its luxury and high-end design design, goes all out with their appliances. 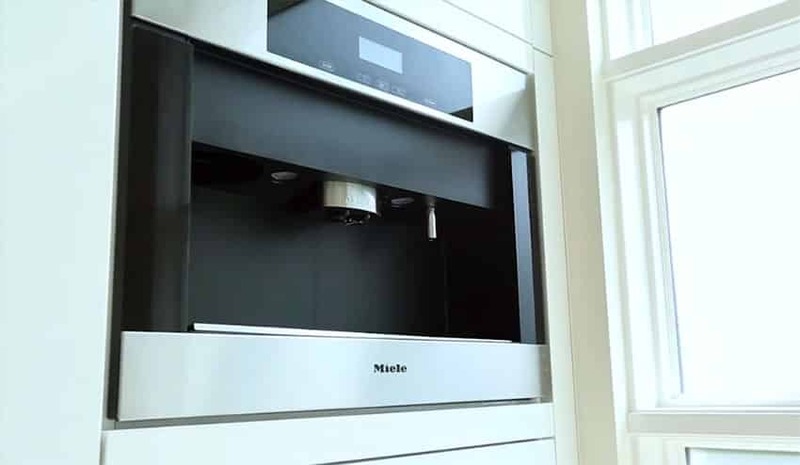 The kitchen is equipped with a Miele brand built-in coffee maker. The dining room keeps to the modern look of the place. Adjacent to the main kitchen, it has a similarly white and clean look offset only by the interesting wall-mounted artwork hung on the texture accent wall to the back of the room. The polished wood-top dining table is long enough to accommodate ten seats. The dining table seats are a minimalist upholstered set. 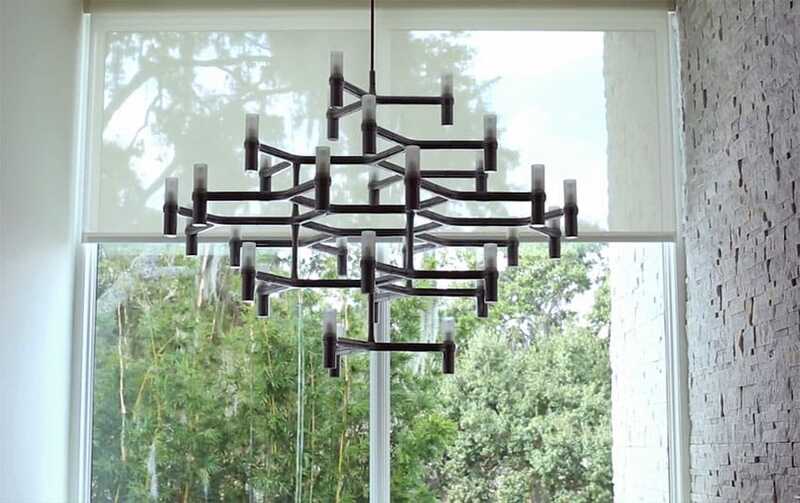 The hung modern box chandelier is subdued yet subtly defines the space. From the modern dining room, it opens up to the aforementioned covered patio area and outdoor kitchen. Great lake views can be seen from the dining area, making everyone’s dining experience all the more special. From this view, one can see the open layout of the space – the adjacent white gloss kitchen is placed right next to the dining room. The modern living room has more personality than most of the other common spaces. We have the gas fireplace placed on the main accent wall with stacked stone wall tiles. This sort of wall finish can also be seen in various other places in the house as well as on some external walls. Casual furniture is intelligently strewn about the living area, further personalizing the space. The casual decoration is a stark contrast from the clean aesthetic of the rest of the house. The furniture, although creatively unique, still keep a clean look. 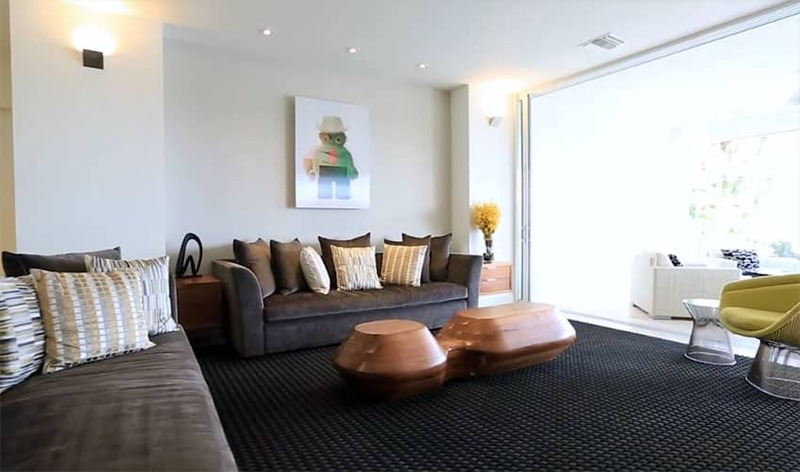 The dark colored sofas match the black area rug. The custom carved wooden coffee table is a work of art in and of itself. The bright green lounge chair is one of the few bright pops of color in this space. 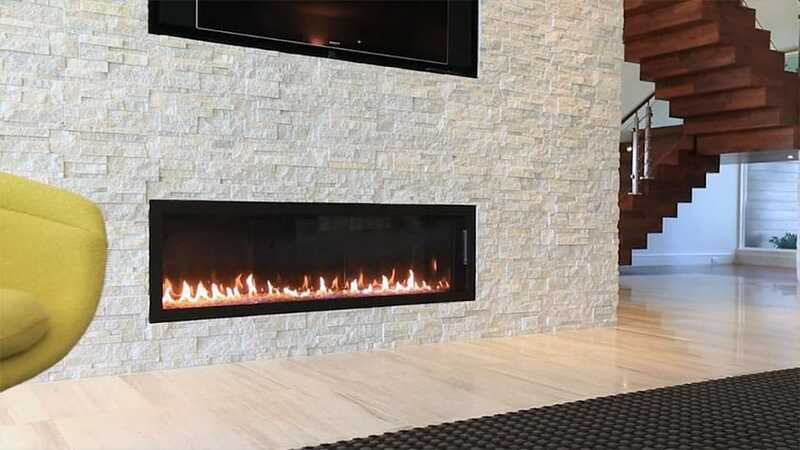 The modern gas fireplace can be seen more clearly in this close-up view. The stone wall is a visually adventurous surface which is seen in many places in the home – this cohesive ties all space together as if a ribbon runs through the whole house. The open concept of the spaces makes the overall feel open and airy. The living room and the receiving area are located right next to each other and are also both in close proximity to the dining room. The wood staircase leading to the second story of the house is an artful statement in terms of design. The bold use of wood, glass, and steel together creates a harmony that really speaks to homeowners and designers alike. This is why this combination of materials is used frequently in modern home designs. 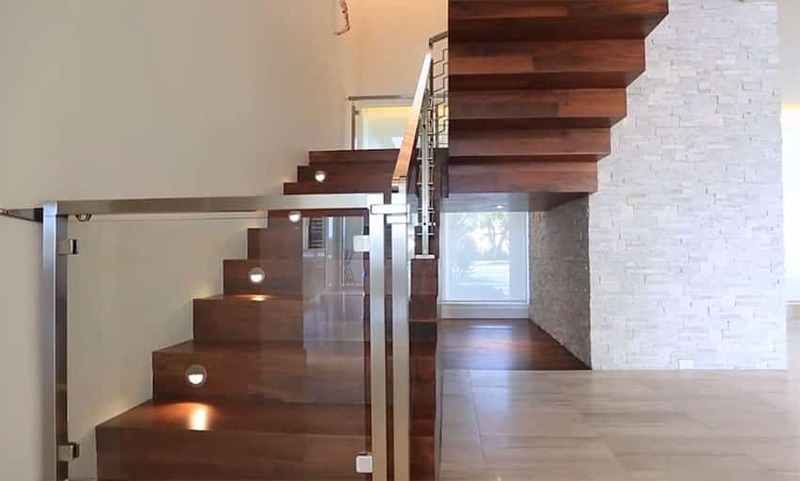 Richly stained and varnished luxury custom wood is used on the treads of the staircase, while built-in step lights are incorporated into the design for aesthetic and functional effect. 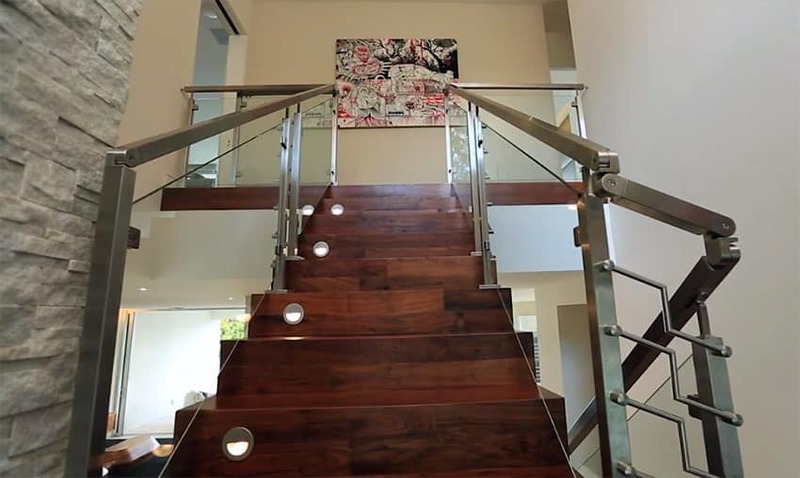 The stainless steel railings, more clearly seen in this view, frame the glass enclosures of the stairs. The glass itself minimizes visual obstruction and keeps with the open feel of the house. 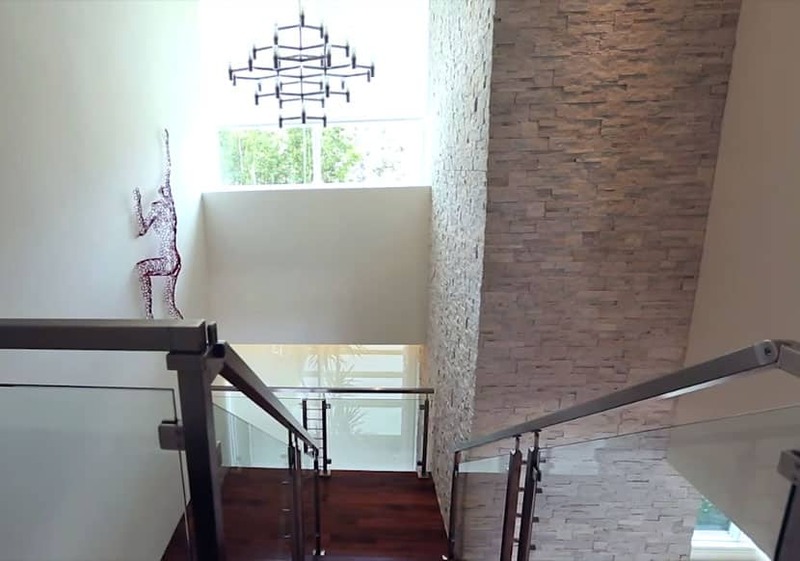 From the top of the steps, one can more clearly see the interior design of the home. This angle also lets you see an eclectic and tasteful anthropomorphic steel sculpture climbing the left wall. A glimpse of the modern stairway chandelier can also be seen. The custom modern chandelier takes its inspiration from traditional candle-holding chandelier of the past. Its unique branch like lighting fixtures really create a striking piece of design suited for the home. Its backdrop of the outdoor bamboo trees is a nice touch. The master bedroom is a good example of cozy yet luxurious design. The lake views can be seen through the curtain glass sliding doors that open up to the personal balcony on the second floor. The room itself has a large king-sized mattress and several lounge chairs for relaxation. The modern bedroom design has a simple yet bold black and white color palette with brown hints seen on the wood flooring. The wall-sized leather headboard covers the whole accent wall behind the king-sized mattress. This is also a clearer view of the S-shaped lounge chair as well as the padded arm chairs that make a small reading nook in one corner of the room. The bathroom of the master bedroom is equally high-end and offers clean modern lines. It employs white gloss acrylic panel finished cabinets similar to the ones used in the ground floor’s main kitchen. The balcony of the master bedroom extends all the way to the side of the bathroom and can be accessed through the bathroom’s glass sliding doors as well. Lake views can be appreciated through the glass sliding doors. The guest bedroom has a cozy feel to it, using muted tan and beige tones to really keep the room feeling warm yet clean. The light wood floors match the bed sheets, curtain, and wall finishes. 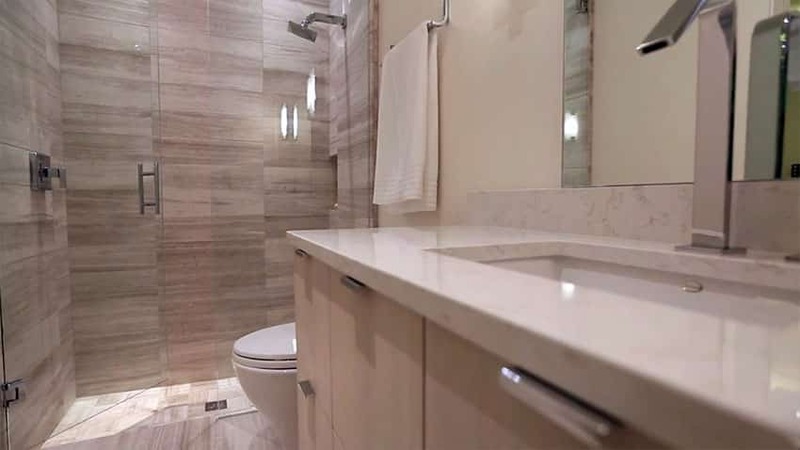 The guest room’s luxury bathroom has a simple frameless glass shower enclosure, granite and marble patterned porcelain wall and floor tiles, and clean stainless steel plumbing fixtures used in the shower as well as the marble counter top lavatory. Modern lifestyles aren’t complete without some form of fitness regimen thrown into the mix. 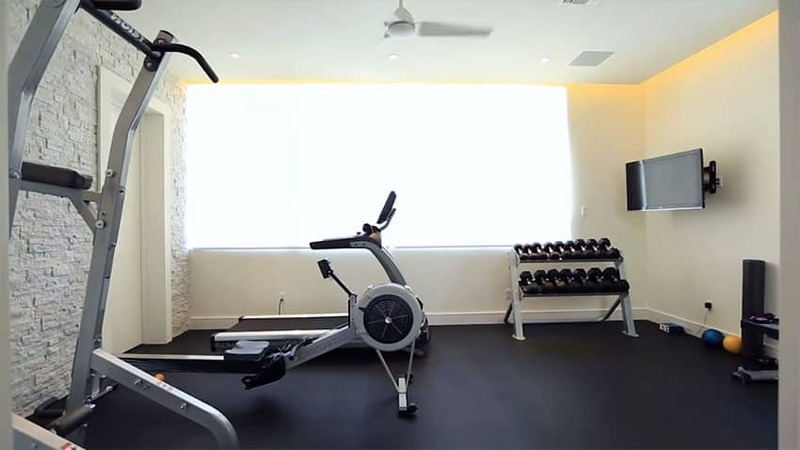 Luxury modern homes like this one can more commonly be seen with personal home gyms such as the one in this picture. The workout room has exercise machines, padded flooring, and a small entertainment center. The girl’s bedroom of the house is expectantly personalized and customized. Pink and white are prolifically used in the room, with floral wallpapers, a white bedroom drawer and shelf set, and pink covers for the bed. The purple lounge chair is also a nice touch. The boy’s bedroom is equally as personalized. The wallpaper for the accent wall employs a cars and truck pattern of different pops of color. The rest of the room has bright, bold, block textures and colors that really liven up the place. A pocket sliding door separates the boy’s bedroom from the ensuite bathroom. The bathroom comes equipped with a small bathtub and a shower. The lavatory and toilet are also integrated into the relatively small space. The child’s playroom has a chalk wall for creative works – it puts a new spin on playrooms by actually promoting drawing on walls. A play outdoor kitchen for children as well as a child-size dining table and piano can also be seen scattered around the space. The glass and steel contemporary chandelier used to illuminate the space is a stylish design choice. The family room is adjacent to the workout room/home gym. It has a large black contemporary entertainment center built into the entire front wall. On it is a built-in bench seating that can be used when the entertainment center is not being utilized. This give the room even more seating space. The furniture used are an eclectic bunch. There is the microsuede sectional sofa, red leather armchairs, and a white solid-surface coffee table. On the other side of the family room, we can see a second story outdoor balcony area. The interior opens up to this space with large sliding glass doors that gives users an unobstructed view of the lake beyond the balcony. The second story balcony provides clear vistas of the lake with the use of its clear glass railings. From this view, one can also see the outdoor pool area and the boat deck located at the back of the home. 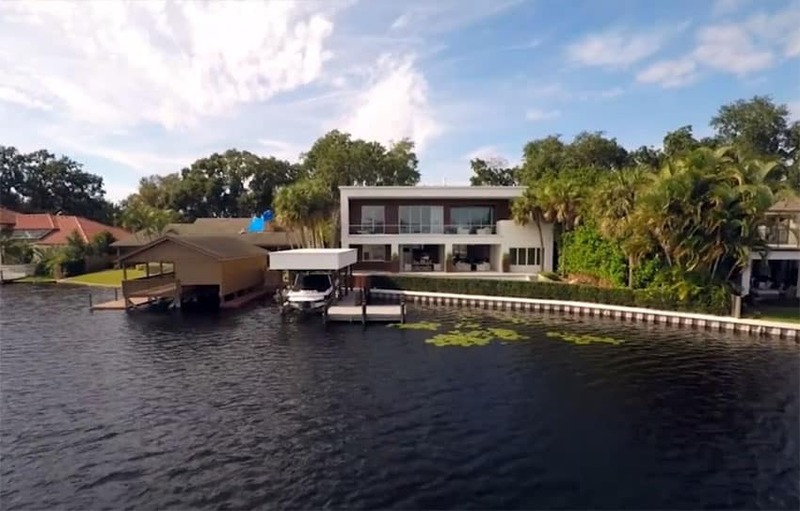 The modern home is a lake-front with an expansive backyard with an integrated boathouse that houses the family boat. From this view, the back of the house serves as a second face to the home. We can also see, from this angle, the tropical trees used as landscaping around the house. This 4-bedroom, 6-bath custom modern home by Phil Kean Designs is a remodel project that’s truly one for the books. It’s simple yet bold, minimalist yet undeniably visually exciting, and clean and sleek yet welcoming and homey. The top floor patio views of the lake are also undeniably breath-taking. 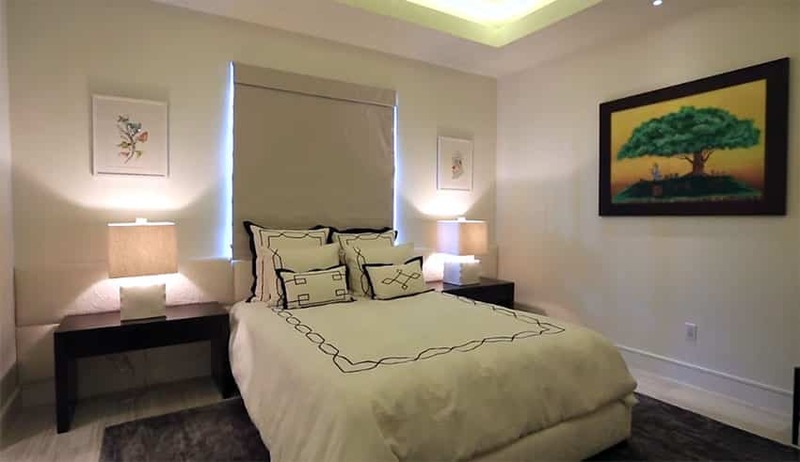 It creates an unmatched ambiance that really gives the home even more charm than it already has with its own interior design and architectural layouts. The swimming pool area in the backyard has a built-in hammock, clean flat hedges that really frames the views overlooking the lake, and really matches the overall vibe of the modern house that it services. To see more related designs visit our pages about modern concrete house or modern house design here.